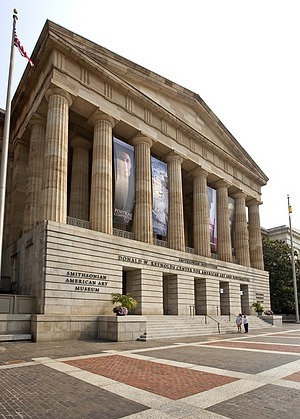 The history of the Smithsonian American Art Museum collection dates to the beginning of the Smithsonian Institution when, in 1846, the act establishing the Smithsonian authorized the Board of Regents to collect objects of art. Called the Gallery of Art, the collection included prints and drawings collected by George P. Marsh and North American Indian portraits and paintings by John Mix Stanley and Charles B. King. Portions of the collection were transferred from the National Institute, housed in the US Patent Office Building, in 1858 and 1862. In 1865, a fire in the Smithsonian Institution Building destroyed a sizable portion of the collection. The surviving prints and drawings were loaned temporarily to the Library of Congress, while the paintings and sculptures were sent to the Corcoran Gallery of Art. These deposits were recalled in 1895. In 1879, the George C. Catlin collection of American Indian paintings was acquired. In 1904, President Theodore Roosevelt recommended to the US Congress that the art collection contemplated in the act creating the Smithsonian be established as a national gallery of art and that the Institution be authorized to accept additions to the collection. Congress failed to take action on the recommendation. In 1906, the Gallery of Art achieved official status when the Supreme Court of the District of Columbia, interpreting the Smithsonian's organic act, defined the Gallery of Art to be, in fact, the National Gallery of Art. 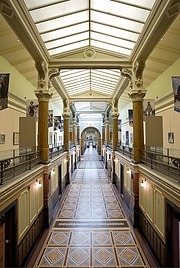 The Harriet Lane Johnston collection, donated to the Smithsonian in 1906, and the William T. Evans collection, donated in 1907, formed the nucleus for the new gallery, located in the original US National Museum building (now the Arts and Industries Building). In 1910, the gallery opened the first exhibits in new US National Museum building. The National Gallery of Art was administered by the US National Museum from 1907 until 1920, when Congress granted the gallery enough funds to become a separate Smithsonian bureau. William Henry Holmes, Chief of the Bureau of American Ethnology, 1902-1909, and Head Curator of the Department of Anthropology, 1910-1920, held the position of Curator of the National Gallery of Art, 1907-1920. When the gallery became a separate bureau in 1920, Holmes resigned his position with the National Museum and became the first director of the gallery. In 1937, the National Gallery of Art had its name changed to the National Collection of Fine Arts (NCFA), when the old name was assigned to the collection donated by Andrew W. Mellon to the United States. 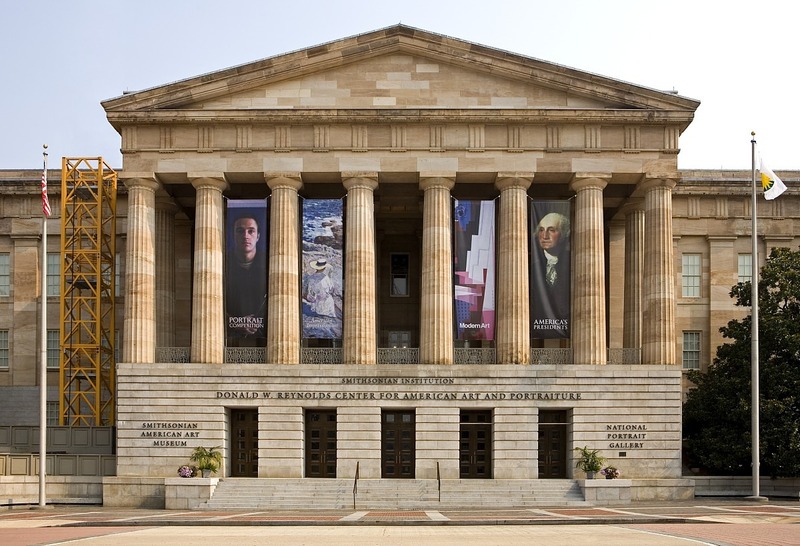 In 1980, NCFA was renamed the National Museum of American Art, and in 2000 it was renamed the Smithsonian American Art Museum. More than seven thousand artists are represented in the collection, including major masters, such as John Singleton Copley, Gilbert Stuart, Winslow Homer, John Singer Sargent, Childe Hassam, Mary Cassatt, Georgia O'Keeffe, Edward Hopper, Jacob Lawrence, Helen Frankenthaler, Christo, David Hockney, Jenny Holzer, Lee Friedlander, Nam June Paik, Martin Puryear, and Robert Rauschenberg. The American Art Museum collection has had many homes. 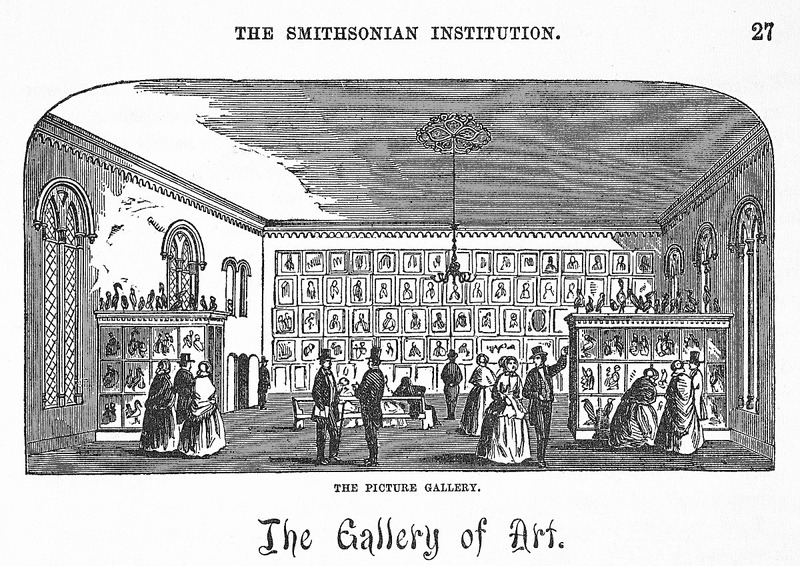 Before 1906, the gallery exhibited its collection in the Art Room of the Smithsonian Building or Castle Library. Between 1907 and 1909, the collection was divided between the original US National Museum building and the Corcoran Gallery of Art. 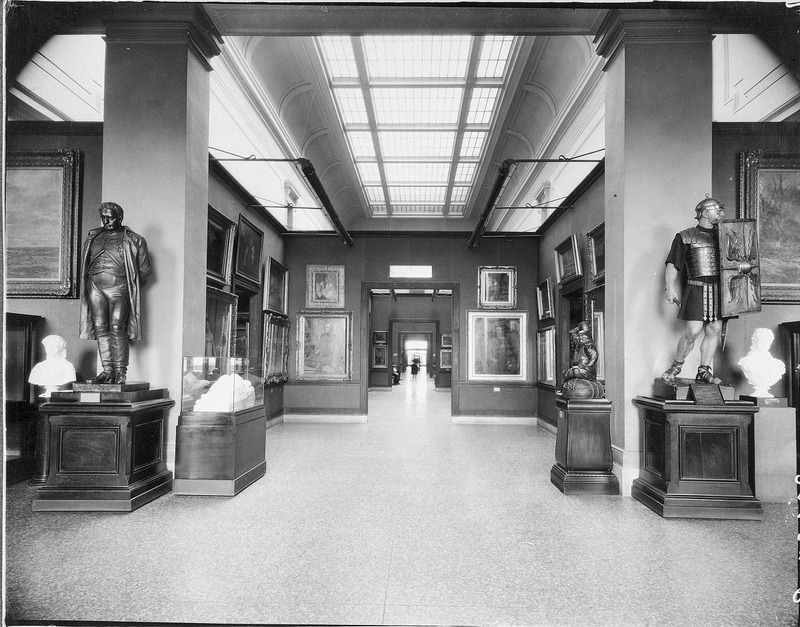 In 1910, the collection was consolidated and moved to a hall in a newly constructed National Museum building where, in March of that year, the gallery opened the first exhibition to be staged in the building. In 1924 and again in 1939, architectural plans for the Gallery were drawn up, but funds were never appropriated for a building. 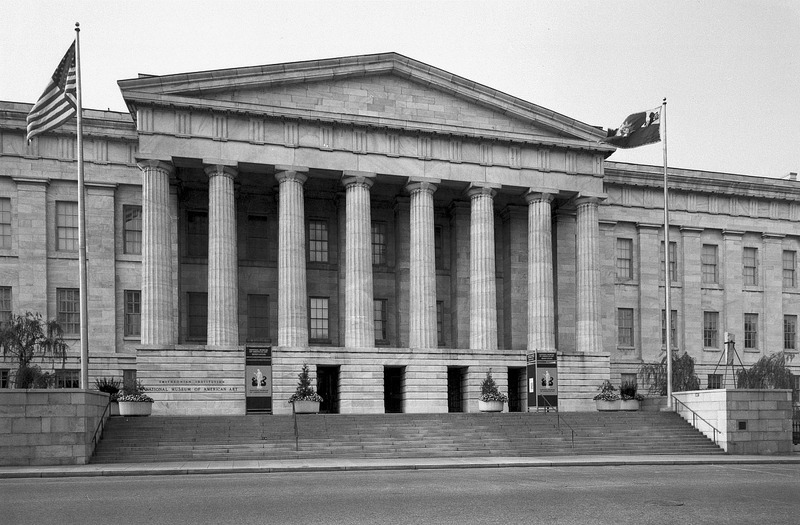 In 1968, the American Art Museum and National Portrait Gallery were moved to the old Patent Office Building which was renamed the Fine Arts and Portrait Galleries. Listed on the National Register of Historic Places, the Patent Office Building is one of the oldest public buildings in Washington, DC and is considered one of the finest examples of Greek Revival public architecture in the United States. Architects who designed the building included Robert Mills (1781–1855), Ithiel Town (1784–1844), Alexander Jackson Davis (1803–1892), Thomas U. Walter (1804–1887) and William Parker Elliot (1807–1854). The building has four wings around a central courtyard and is constructed of freestone and sandstone from Virginia and marble and granite from Maine, Massachusetts, Connecticut, and Maryland. In 1972, the Museum gained additional gallery space with the acquisition of the Renwick Gallery. The Renwick is located in the old Corcoran Gallery of Art Building which was designed by architect James Renwick, Jr., who also designed the Smithsonian's Castle. The Renwick Gallery is devoted to American crafts. In 1981, the Fine Arts and Portrait Galleries building was renamed the American Art and Portrait Galleries. In 2006, the Museum building reopened after an extensive renovation, now named the Donald W. Reynolds Center for American Art and Portraiture. The Museum houses The Luce Foundation Center for American Art, the first visible art storage and study center in Washington, allows visitors to browse more than 3,300 works from the collection and the Lunder Conservation Center, which is shared with the National Portrait Gallery, and is the first art conservation facility to allow the public permanent behind-the-scenes views of the preservation work of museums.